As I mentioned in my previous post, Hey Boo-Boo, Let’s Go Get Ourselves a Pic-a-nic Basket, when I think of Yellowstone, the first thing that comes to mind is Yogi Bear and grizzly bears. The second is Old Faithful. Old Faithful is a geyser in Yellowstone that continuously draws people to experience it, paint it, and photograph it. It attracts people from not only all over the country, but all over the world as well. Everyone has heard of and wishes to experience Old Faithful. Out of the three million people that visit Yellowstone a year , almost all of them visit Old Faithful . Now what makes this geyser so incredible? Why do people feel such a need to experience it? While it isn’t the largest geyser in the world, but it is the most “faithful.” Old Faithful is one of three geysers in the world that are coined “faithful.” Out of these three, it has the highest number of regularly repeating eruptions in the world . Once word began to spread about this natural wonder, people wanted to visit it and try their best to capture it. But things have changed from the times of Washburn, Langford, and Doane. Geysers are very sensitive geological features. After the 1959 Hebgen Lake earthquake, the period of time between Old Faithful’s bursts increased . It continued to increase in the latter half of the twentieth century, with many scientists attributing the change to the development of parking lots and other construction in the area . So while Old Faithful may not be as faithful as it used to be, now going off about every 92 minutes (plus or minus 10 minutes), it still remains as awe-inspiring and photogenic as ever. 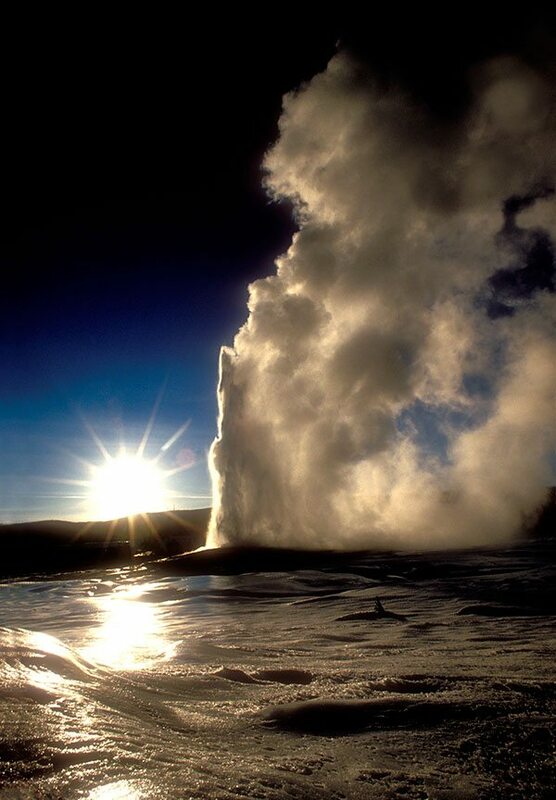 For more on Old Faithful, check out Points West Online: Yellowstone National Park and Park County, Wyoming, Photographers and Treasures from Our West: Preussl’s “Old Faithful” by Nancy McClure, our electronic communications manager and assistant editor of Points West . 2. National Park Service, “Visitation Statistics,” National Park Service, accessed August 12, 2014, http://www.nps.gov/yell/planyourvisit/visitationstats.htm. 3. “The Old Faithful Historic District,” The Yellowstone Park Foundation, accessed August 14, 2014, http://www.ypf.org/site/News2?page=NewsArticle&id=5267. 4. National Park Service, “Old Faithful Geyser,” Yellowstone National Park, accessed August 1, 2014, http://www.nps.gov/features/yell/tours/oldfaithful/oldfaith.htm. 5. Nathaniel Pitt Langford, Diary of the Washburn Expedition to the Yellowstone and Firehole Rivers in the Year 1870 (St. Paul, MN, 1905), 107-108, PDF. 6. National Park Service, “Predicting Geysers: Old Faithful,” Old Faithful Virtual Visitor Center, accessed August 14, 2014, http://mms.nps.gov/yell/ofvec/exhibits/eruption/prediction/predict7.htm. the Year 1870. St. Paul, MN, 1905. PDF. McClure, Nancy. 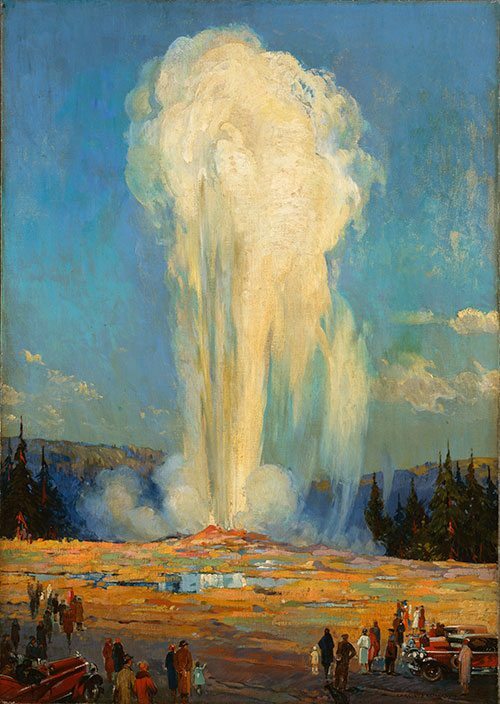 “Preussl’s ‘Old Faithful”.” Treasures from Our West (blog). Entry posted March 24, 2014. Accessed August 13, 2014. https://centerofthewest.org/2014/03/24/treasures-from-our-west-preussls-old-faithful/. National Park Service. “Predicting Geysers: Old Faithful.” Old Faithful Virtual Visitor Center. Accessed August 14, 2014. http://mms.nps.gov/yell/ofvec/exhibits/eruption/prediction/predict7.htm. —. “Old Faithful Geyser.” Yellowstone National Park. Accessed August 1, 2014. http://www.nps.gov/features/yell/tours/oldfaithful/oldfaith.htm. —. “The Old Faithful Historic District.” The Yellowstone Park Foundation. Accessed August 14, 2014. http://www.ypf.org/site/News2?page=NewsArticle&id=5267.